There are many options to consider when choosing deck builders for your property. A new deck isn’t just as simple as bringing in some lumber and nailing together a flat surface. Factors such as materials, budget, color, and zoning all have to be considered, and you want a decking contractor with ample experience to ensure your deck is safe and long-lasting. Kelley Construction Contractors, Inc. is your trusted deck builder, serving all areas surrounding Peoria and Central Illinois. Whether you are ready to design a completely new deck or are needing some deck repair and restoration, contact us first. Does your deck need some TLC? Let us design and build you a deck that provides you more livable space and may improve the value of your property. The considerations above are just a few details to think about but don’t feel like you have to have everything planned before you contact us. As your decking experts, we will help you figure out all the details and take care of the construction, as well. Sure, you can probably find some easy DIY fixes online that will save you money up front, but it’s best to have an experienced contractor provide your deck repairs to ensure they are done correctly and will leave you with a safe deck. 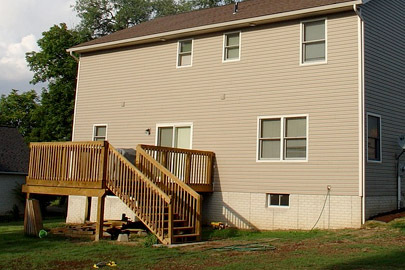 Kelley Construction Contractors, Inc. can provide efficient, affordable deck repairs that will restore your deck back to working condition. Whether you have the deck of your dreams all planned out or are just dissatisfied with your current deck but aren’t sure how to make it better, contact Kelley Construction Contractors, Inc. We provide free, no-hassle estimates, along with design and construction services to give you the perfect deck for your property.